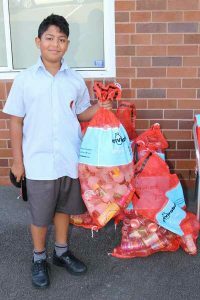 During Week 7 we had our first collection for the Environment Portfolio’s Return and Earn initiative. Students diverted 1,435 containers from landfill and helped to raise $73.50 toward the Environment Portfolio’s goal of raising funds for our sponsor student Frederick in Kenya. This is a fantastic and positive start to this program and we want to thank all students for making a conscious effort to improve our habits. A reminder to all students to be mindful when discarding their drink containers, particularly those that are purchased through our Cafeteria. The Cafeteria sells approximately 200 drinks per day – all of these drink containers can be placed in the Envirobank cages located in the quad and TAS areas or yellow bins around the grounds. Remember 2 Waterford Hours and 2 Tatham Points will be awarded to each full orange Return and Earn bag. 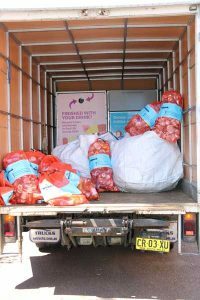 Stay tuned for more information on the student led ‘Trash Free Tuesday’ initiative. 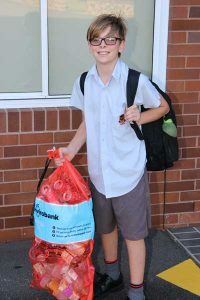 Students are meeting this week to put together some resources to help parents and students pack trash free lunches for next term. There will be prizes drawn out of a raffle next term for those who get on board!!! 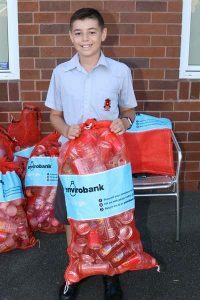 If any parents or carers would like to get involved or have any ideas to support St Edward’s Envirobank Return and Earn Scheme or ‘Trash Free Tuesday’, please contact the College. If you are having a function, event or party and would like a few orange Return and Earn bags please contact either Mr Gentle or Mrs Beynon.